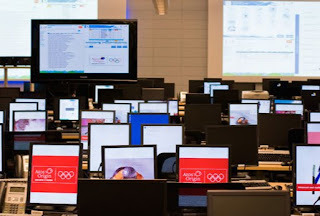 Running an operation of Olympic proportions (sorry, had to ;) requires a robust tech setup. Enter the Technology Operations Center in Vancouver. This command center looks like CTU (for you 24 lovers, including rows of screens, countless pieces of tech and a staff of 130. I'm always amazed at stats like these. Just think, getting us our results within a moment's notice during while we're at work away from our TVs happens thanks to all of this technology, infrastructure and staffing. Wonder if they realise how much we appreciate it? Check out CIO magazine's slideshow for a deeper look behind the scenes. Seen any other kewl tech these Olympics? Leave a comment!